Babies cry a lot, some more than others. Try not to take it personally. The world is big and new and rough for baby’s immature nervous system to process. Even so, it is hard to hear your baby cry, so the following blog post will give you some ideas about why your baby might be crying and how to help him or her feel more settled. Hunger: babies have tiny stomachs, and, especially when they are very young, need to eat often. You can try feeding your crying baby. Exhaustion and overstimulation: sometimes babies get so sleepy or overwhelmed that they cry. They might want your help to move into a less-stimulating place and perhaps be swaddled and definitely laid on their back to sleep. Temperature: babies might cry when they are too hot or too cold. Need a fresh diaper: some babies hate feeling wetness against their skin and some babies don’t mind. Feeling full: some babies cry when their tummies are very full, but this discomfort usually passes in a short time. Caffeine: some babies who receive caffeine via breast milk have a hard time falling asleep. Pain: babies cry when they are in pain, maybe from getting poked by an uncomfortable zipper, squeezed by a hair tourniquet, or for some other reason. You can carefully check your baby over to identify any things that might be causing them pain. 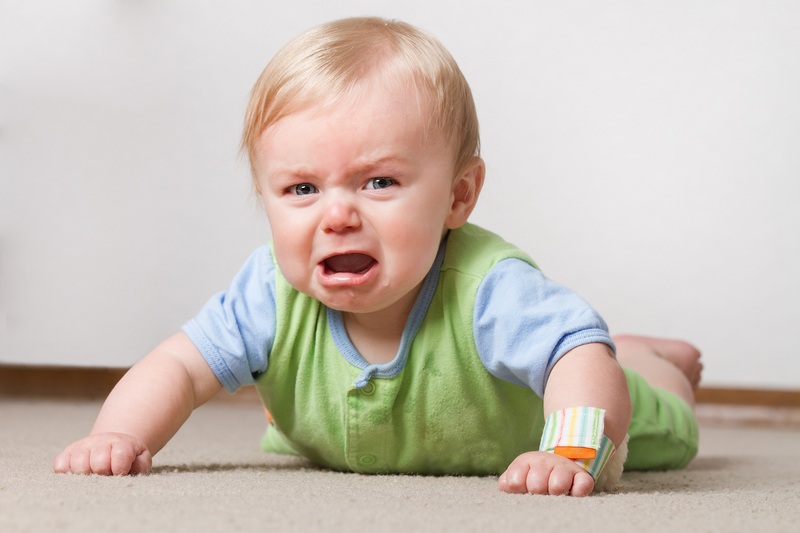 Bore your baby: overstimulated babies cry more than babies who are in a quiet, calm, less bright environment. Turn the lights down. Keep things quiet, sing or talk soothingly in a low voice, or turn on white noise. More or less movement: if you have been bouncing or jostling your baby, try holding them still, laying them flat on their backs in a safe place with just your hand lightly resting on their belly or foot, or gently swaying or walking with them. Always hold baby close to you or lay them down on their back in a safe place to avoid shaking them, especially if they have been crying a lot and you feel frustrated. Babywearing: sometimes babies just want to be held, and you can use a piece of equipment called a baby carrier to safely attach them to your body and still keep your hands free. Often a baby will fall asleep while being worn because the sounds, movement, and warmth remind them off the womb. Sucking: breastfeeding or sucking on a pacifier might help your baby calm down. Change of scene: going for a quick walk outside for fresh air and different things to look at and listen to might help your fussy baby; if the weather is not amenable to an easy stroll out of the house, sometimes just walking into a different room or looking out the window will help. Cuddle skin-to-skin: baby could be craving closeness with a loved one. Try stripping down your baby to just their diaper and laying them on your bare chest. The sound of your heartbeat and the warmth will likely be soothing for them. You can lay a light receiving blanket over baby’s back if you worry that they might be cold without clothes on. Swaddling: some babies love swaddling and some hate it. You will get to know your baby’s preferences and whether it helps with crying. Try listening to your baby’s cries without jumping immediately to shush them or fix a problem; you might be surprised if you start to understand baby’s different cries for different needs. If you have a very fussy baby, enlist help from friends, family, and professionals like doulas and baby nurses to get through this challenging time. It is always okay to set baby down in a safe place—such as their crib—and take a five-minute breather or ask your coparent to take over. And as always, if you have concerns about your baby’s health, talk to your pediatrician. National Center on Shaken Baby Syndrome, What is the period of PURPLE crying?